By Zhang. Posted 2009-08-02 at 18:57. Filed under Electronica and tagged Japan. Permalink. Subscribe to this post’s comments. Both comments and trackbacks are currently closed. After his “Un” released on Bypass #18, Mel returns to Bypass with his new “Noncompliance”. Actually I have tried to describing what my feels after i listend this album, but i think it just only one word – Beautiful. 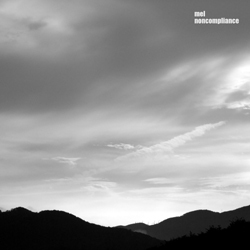 “Noncompliance” was produced in spring, 2009. “Intro” was recorded in a studio in June, 2009. Mel and friend “Junji” performed collaboration in a studio. Friend “Junji” plays the guitar in “Intro”. The guitar sound of “Junji” is very unique. All the tracks except “Intro” were produced by Mel alone. Mel produced ambient music characterized by a drone till now. However, in “Noncompliance”, different approach is tried. Second release for Roots Ista Posse on Fresh Poulp Records.